Well, the world did not end on May 21st, but to be sure the weather is a little odd. Should we be concerned? There has been flooding in the south of Thailand twice in the last year, and also floods last year in the north of Thailand. There has also been very cold weather especially in the north of Thailand (Phuket does not really get cold - I think about 20 degrees in the night is considered cold here!). Meanwhile in Australia - floods, typhoon, fires due to dry weather. The USA has had some extreme twisters (tornados) this year too. Is extreme weather getting more common? Is 2012 going to be worse? Can we do anything about it? The weather is based on global patterns. A butterfly flaps it's wings in a sunny England meadow, and a tornado wipes out a town in Missouri. Back to Phuket ... we had a very wet March - no floods here, but still had 400mm of rain, way more than average. April was drier than normal, and so far I have measured 130mm of rain in May (monthly average 265mm) - and most of that being night rain. So many sunny days apart from a few crappy days around the 9th. You can see from my pictures at the After Beach Bar (taken on the 19th) - it can be very nice weather in the low season. Hotels offer really low rates - have a look at Phuket Hotels on Agoda.com. Chance of rain, but you can stay in a very nice resort for 1,000 - 1,500 Baht per night. If you "took the risk" in May this year, well done! Success! My work in Phuket - I am the manager of a dive shop called Sunrise Divers, based at Karon Beach. I have logged more than 1000 dives in this area, but had not dived for a couple of years until this week. I guess I had got a bit stuck behind the desk, but this low season I am determined to get out and dive at all the local dive sites. 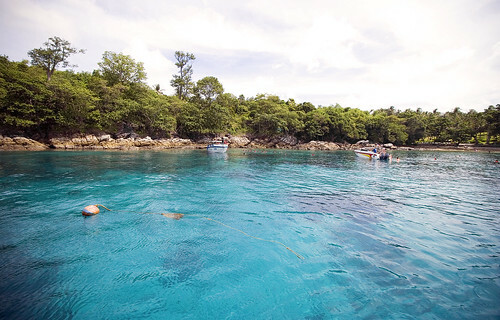 On Wednesday my wife and I joined a day trip to Racha Yai island - the diving there is easy, not much current and depth 12 - 20m. So nice to be back in the water! And my dear wife was even happier, since she's not dived since about 2002! We had 2 dives, each one nearly an hour in duration. (above) Racha Yai - yes the water does look like this! Underwater visibility averages about 20 meters. We saw loads of marine life ranging from tiny pipefish to big puffers, stingrays, butterflyfish, angelfish, scorpionfish, a big school of barracuda, a big school of rabbitfish, garden eels, boxfish, wrasse, triggerfish and more.. a dive at Racha Yai is always nice and relaxing. Contact me at Sunrise Divers if you want to dive! Non weather news .. Prime Minister Abhisit was in Phuket yesterday for an election rally. He really should head up North, coz Phuket is going to vote for him anyway. He might want to visit other parts of the country who, for some reason, think that voting for Thaksin's sister is a good plan. For Thai election news, you can follow @ThaiElection11 on Twitter. The election is on July 3rd. 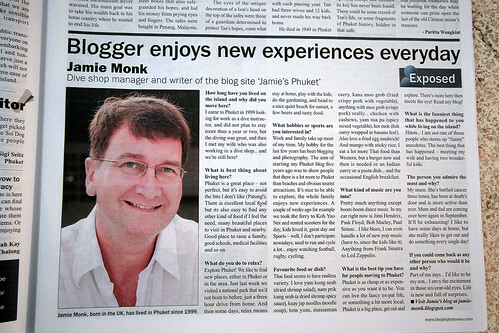 For Phuket weather news and more, follow me @jamiemonk on Twitter please! And while we're on the self promotion - see the DONATE thingy top left of this page? You can click on that you know and donate an amount of your choice to help this blog, maybe to help the blogger with a new camera or to help the bloggers kids through school or just to buy the blogger a cold beer. Thanks. Beer be the food of Blogs. This blog gets on average 300 - 400 visitors per day. If just 10 readers donated 10 dollars every day, that would be great. Kids could eat more than just rice and I could get a real cup for my tea, instead of just sucking on a damp cloth. June coming soon. Simon and Garfunkel sang "June, she'll change her tune". True. June 2010 we had more than 500mm of rain. In June 2009, only 50mm. What will 2011 bring? Stay tuned! I'm hoping for fair weather, since I am a fair weather diver.